Nominate the businesses you'd like to see evaluated here. If someone hasn't already done it, we'll ascertain if the business is carry friendly and post results of the workup in seven to ten days if possible. Just because a place does not have a sign posted does not mean that you should be comfortable carrying there. They may still subject you to a general trespassing complaint. To avoid the attendant legal issues CarryAdvice.com recommends that you thoroughly research a places weapons policy before attempting to carry there. Nominate the establishment you'd like to see evaluated here. If someone hasn't already done it, we'll ascertain if the business is carry friendly and post results of the workup in seven to ten days if possible..
Post the topics and news articles regarding weapons that you see so we can talk about them. Post everything to do with American Samoa. Try not to post anything here that could go in the general area. If it shoehorns into this territory it can go here. Post everything to do with Alabama State. Try not to post anything here that could go in the general area. If it shoehorns into this state it can go here. Post everything to do with Alaska State. Try not to post anything here that could go in the general area. If it shoehorns into this state it can go here. Post everything to do with American Samoa. Try not to post anything here that could go in the general area. If it shoehorns into this state it can go here. Post everything to do with Arizona State. Try not to post anything here that could go in the general area. If it shoehorns into this state it can go here. Post everything to do with California State. Try not to post anything here that could go in the general area. If it shoehorns into this state it can go here. Post everything to do with Colorado State. Try not to post anything here that could go in the general area. If it shoehorns into this state it can go here. Post everything to do with Connecticut State. Try not to post anything here that could go in the general area. If it shoehorns into this state it can go here. Post everything to do with Delaware State. Try not to post anything here that could go in the general area. If it shoehorns into this state it can go here. Post everything to do with Florida State. Try not to post anything here that could go in the general area. If it shoehorns into this state it can go here. Post everything to do with Georgia State. Try not to post anything here that could go in the general area. If it shoehorns into this state it can go here. Post everything to do with Guam Territory. Try not to post anything here that could go in the general area. If it shoehorns into this territory it can go here. Post everything to do with Hawaii State. Try not to post anything here that could go in the general area. If it shoehorns into this state it can go here. Post everything to do with Idaho State. Try not to post anything here that could go in the general area. If it shoehorns into this state it can go here. Post everything to do with Illinois State. Try not to post anything here that could go in the general area. If it shoehorns into this state it can go here. Post everything to do with Indiana State. Try not to post anything here that could go in the general area. If it shoehorns into this state it can go here. Post everything to do with Iowa State. Try not to post anything here that could go in the general area. If it shoehorns into this state it can go here. Post everything to do with Kansas State. Try not to post anything here that could go in the general area. If it shoehorns into this state it can go here. Post everything to do with Kentucky State. Try not to post anything here that could go in the general area. If it shoehorns into this state it can go here. Post everything to do with Louisiana State. Try not to post anything here that could go in the general area. If it shoehorns into this state it can go here. Post everything to do with Maine State. Try not to post anything here that could go in the general area. If it shoehorns into this state it can go here. Post everything to do with Maryland State. Try not to post anything here that could go in the general area. If it shoehorns into this state it can go here. Post everything to do with Massachusetts State. Try not to post anything here that could go in the general area. If it shoehorns into this state it can go here. Post everything to do with Michigan State. Try not to post anything here that could go in the general area. If it shoehorns into this state it can go here. Post everything to do with Minnesota. Try not to post anything here that could go in the general area. If it shoehorns into this state it can go here. Post everything to do with Mississippi State. Try not to post anything here that could go in the general area. If it shoehorns into this state it can go here. Post everything to do with Missouri State. Try not to post anything here that could go in the general area. If it shoehorns into this state it can go here. Post everything to do with Montana State. Try not to post anything here that could go in the general area. If it shoehorns into this state it can go here. Post everything to do with Nebraska State. Try not to post anything here that could go in the general area. If it shoehorns into this state it can go here. Post everything to do with New Hampshire State. Try not to post anything here that could go in the general area. If it shoehorns into this state it can go here. Post everything to do with New Jersey State. Try not to post anything here that could go in the general area. If it shoehorns into this state it can go here. Post everything to do with New Mexico State. If it shoehorns into the state it goes here. Post everything to do with Nevada State. If it shoehorns into the state it goes here. Post everything to do with North Carolina State. If it shoehorns into the state it goes here. Post everything to do with North Dakota State. If it shoehorns into the state it goes here. Post everything to do with Northern Mariana Islands. If it shoehorns into the territory it goes here. Post everything to do with Ohio State. If it shoehorns into the state it goes here. Post everything to do with Oklahoma State. If it shoehorns into the state it goes here. Post everything to do with Oregon State. If it shoehorns into the state it goes here. Post everything to do with Pennsylvania State State. If it shoehorns into the state it goes here. Post everything to do with Puerto Rico. If it shoehorns into the territory it goes here. Post everything to do with Rhode Island State. If it shoehorns into the state it goes here. Post everything to do with South Carolina State. If it shoehorns into the state it goes here. Post everything to do with South Dakota State. If it shoehorns into the state it goes here. Post everything to do with Tennessee State. If it shoehorns into the state it goes here. Post everything to do with Texas State. If it shoehorns into the state it goes here. Post everything to do with U.S. Virgin Islands. If it shoehorns into the state it goes here. Post everything to do with Utah State. If it shoehorns into the state it goes here. Post everything to do with Vermont State. If it shoehorns into the state it goes here. Post everything to do with Virginia State. If it shoehorns into the state it goes here. Post everything to do with Washington DC. If it shoehorns into the territory it goes here. Post everything to do with Washington State. If it shoehorns into the state it goes here. Post everything to do with West Virginia State. If it shoehorns into the state it goes here. Post everything to do with Wisconsin State. If it shoehorns into the state it goes here. Post everything to do with Wyoming State. If it shoehorns into the state it goes here. 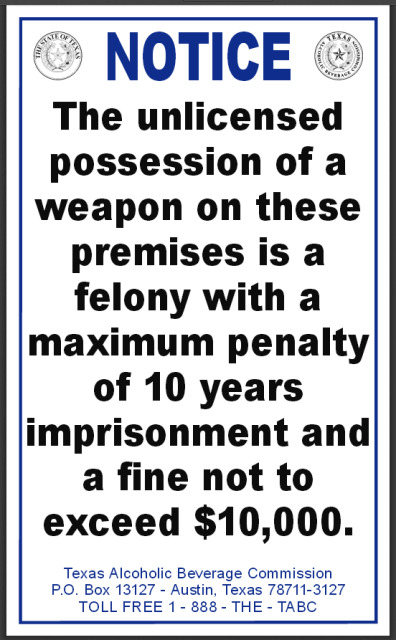 Even though an establishment may let you carry (signage says it is ok) and it is legal, if asked by authorities or establishment employees to leave, please do so as to avoid standard trespassing legal issues. If you see this sign in Texas. DO NOT perform concealed or open carry within Texas on the premises. If you see this sign, DO NOT open carry within the business in Texas. DO concealed carry in the business in Texas. 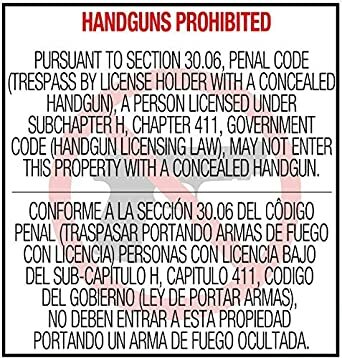 If you see this sign within Texas, as long as you are licensed in Texas, DO carry open or concealed. It is prevalent at stores like Walmart and SAMs club. When carrying in Texas, if you see this sign then DON'T carry period open or concealed. Texas Only: This and any other sign like it. If you see this sign or any like it in Texas only, carry at your own risk. It is not legal. However, anyone who controls the premises can deem you as trespassing. You may or may not beat it but it can cost a myriad of legal problems. Select a forum||--All the forums! Welcome!| |--Business Workup Nomination| |--Establishment Workup Nomination| |--News| |--American Samoa| |--Alabama State| |--Alaska State| |--Arkansas State| |--Arizona State| |--California State| |--Colorado State| |--Connecticut State| |--Delaware State| |--Florida State| |--Georgia State| |--Guam Territory| |--Hawaii State| |--Idaho State| |--Illinois State| |--Indiana State| |--Iowa State| |--Kansas State| |--Kentucky State| |--Louisiana State| |--Maine State| |--Maryland State| |--Massachutts State| |--Michigan State| |--Minnesota State| |--Mississippi State| |--Missouri State| |--Montana State| |--Nebraska State| |--New Hampshire State| |--New Jersey State| |--New Mexico State| |--New York State| |--Nevada State| |--North Carolina State| |--North Dakota State| |--Northern Mariana Islands| |--Ohio State| |--Oklahoma State| |--Oregon State| |--Pennsylvania State| |--Perto Rico| |--Rhode Island State| |--South Carolina State| |--South Dakota State| |--Tennessee State| |--Texas State| |--U.S. Virgin Islands| |--Utah State| |--Vermont State| |--Virginia State| |--Washington D.C.| |--Washington State| |--West Virginia State| |--Wisconsin State| |--Wyoming State| |--Texas Carry Signs |--Texas 30.06 Sign |--Texas 30.07 Sign |--Texas Statute Only: Licensed under subchapter 411 sign |--Texas TABC 51%. sign You'll see this at bars and liquor joints |--Texas Only: This and any other sign like it.